This is a 4 oz, 2.6” by 1.8” by 1.2” quartz, from Corinto, Brazil with a somewhat slanted, healed and misted base (he will self-stand at an angle on it). Light mists fill his base and above that, he is exceptionally clear. There is a blend of starbrary glyphs from different systems (Leo, Cassiopeia and a few Ursa Minor) … a loupe will help to fully read them. Interestingly, on one side, there is a perfect circle … like a moon or sun! A shallow key at the base of one side also holds more glyphs in bas relief. There is a small past timeline and a large future one that also has an adjoining extra facet. He features three Isis faces and some brilliant rainbows! There is a very thin and almost invisible scrape along one terminal face edge, nothing of significance … Corinto quartz is lofty energy to begin with and he is no exception – he will help with Star People contacts and understanding! Starbraries are recognized by the presence of glyph-like markings, symbols and geometric patterns plus usually a doorway or key. By aligning fingers with the doorways or keys, you can unlock different layers, depending on orientation. Companion crystals are important - they either come with the crystal (purchased with or given with) or appear shortly thereafter. They don't have to be quartz, but work with the main crystal to unlock different layers or even gain access to the crystal itself. All Starbraries work like that - the companions facilitate access, although it's possible to gain access just from the Starbrary itself. All of the starbrary formations hold information of peoples who had a positive influence on human growth and evolution. The records were left here so that in the event of catastrophe, there would be a permanent record to help Earth rebuild. Starbraries were placed in many locations so the records could be accessed by peoples all over the world. There are sets of crystals - like chapters or series. When one comes to you, all of a sudden, you will find many more. It is important to ask the order to read them. Click on the link below to see additional pictures. Corinto Master Starbrary Quartz with Timelines, Extra Facet and Isis Faces This is a 4 oz, 2.6” by 1.8” by 1.2” quartz, from Corinto, Brazil with a somewhat slanted, healed and misted base (he will self-stand at an angle on it). Light mists fill his base and above that, he is exceptionally clear. There is a blend of starbrary glyphs from different systems (Leo, Cassiopeia and a few Ursa Minor) … a loupe will help to fully read them. Interestingly, on one side, there is a perfect circle … like a moon or sun! A shallow key at the base of one side also holds more glyphs in bas relief. There is a small past timeline and a large future one that also has an adjoining extra facet. He features three Isis faces and some brilliant rainbows! 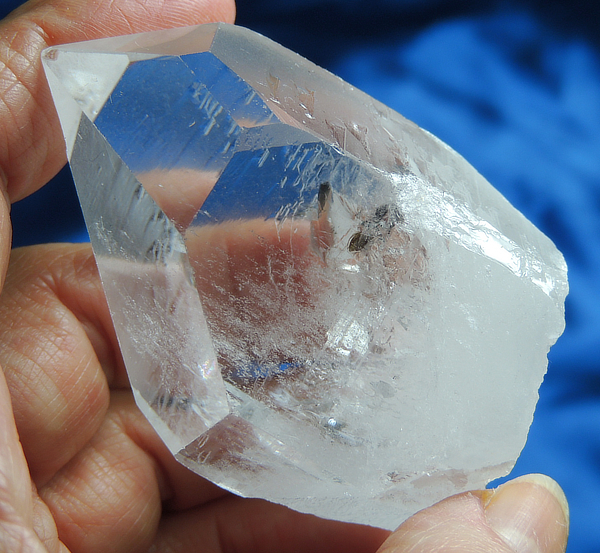 There is a very thin and almost invisible scrape along one terminal face edge, nothing of significance … Corinto quartz is lofty energy to begin with and he is no exception – he will help with Star People contacts and understanding! Starbraries are recognized by the presence of glyph-like markings, symbols and geometric patterns plus usually a doorway or key. By aligning fingers with the doorways or keys, you can unlock different layers, depending on orientation. Companion crystals are important - they either come with the crystal (purchased with or given with) or appear shortly thereafter. They don't have to be quartz, but work with the main crystal to unlock different layers or even gain access to the crystal itself. All Starbraries work like that - the companions facilitate access, although it's possible to gain access just from the Starbrary itself. All of the starbrary formations hold information of peoples who had a positive influence on human growth and evolution. The records were left here so that in the event of catastrophe, there would be a permanent record to help Earth rebuild. Starbraries were placed in many locations so the records could be accessed by peoples all over the world. There are sets of crystals - like chapters or series. When one comes to you, all of a sudden, you will find many more. It is important to ask the order to read them.